The Accidental Locavore saw this recipe from Momofuku online and was intrigued. When I saw the mass of comments raving about the dish, I figured I had to try it. With a last-minute plea to bring Brussels sprouts to my friend’s Thanksgiving leftover party, it was a shoo-in. I’ve adapted it from the Food52 website. It can be served warm or at room temperature and will serve 4-6. 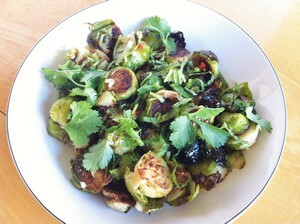 The Accidental Locavore's recipe for Brussels sprouts with an Asian vinaigrette. 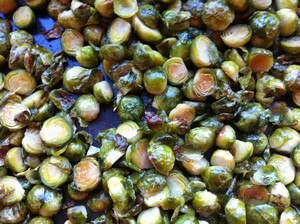 Brussels sprouts side dish recipe, good hot or room temperature. Preheat the oven to 450°. While the oven is heating, trim the Brussels sprouts and cut in half. Put the cut sprouts in a large bowl with 2 tablespoons olive oil. Toss to coat with the oil and put on a large, rimmed baking sheet (preferably with cut sides down). Roast for 10-15 minutes until they start to get nice and brown. Toss and continue to cook for about another 10 minutes until they are browned and tender. While the sprouts are roasting, make the vinaigrette. Combine the fish sauce, water, rice wine vinegar, lime juice, sugar, garlic and chile in a jar. Shake to mix. Taste and adjust by adding more of anything as needed. If the fish sauce is too salty, more lime juice or rice wine vinegar will help. Put the warm Brussels sprouts in a serving bowl, toss with the vinaigrette, cilantro leaves and stems and mint. Serve and enjoy! My Verdict: This was really good and when I took it to my friends, I never had a good taste of it (co-mingled with some great spare ribs, stuffing, etc) so I decided to give it another shot when I could just enjoy it at my leisure. With the second batch, I added the vinaigrette to the just-out of-the-oven sprouts, figuring that with potato salad it’s always better when you toss the warm potatoes with the dressing (it absorbs more of the flavor). Warm, they were great! A good kick from the chiles and a nice umami flavor from the fish sauce. What surprised me both times was the affinity between the Brussels sprouts and the cilantro; it’s quite a magic combination! Personally, I prefer them warm, but try them both ways and let me know what you think. Notes: The original recipe called for 1-3 bird’s eye chiles with the seeds intact. Those little suckers pack a lot of heat! When I made it the first time with two chiles, I ended up trying to remove all the chiles because I thought it was going to be too spicy for a crowd. The second time, I used one chile and seeded it before I sliced it. It packed what I thought was the perfect amount of heat to make things interesting without taking away from the nuttiness of the Brussels sprouts. Also, because the taste of fish sauce (click here to order) can vary widely, go easy on it, taste and add more if you like. I used a brand called “Tips”. I love Brussels Sprouts and this recipe looks intriguing. I might have to try it, although being vegan I’d have to use mock fish sauce. Always great to learn a new way to eat Brussels Sprouts, as well as dishes that can be served at room temperature to travel to parties.